I have a new dog. My last dog Ronan (main character of this blog) died last January. I’ll leave it at that for now as it still hurts. Anyone who has or has had a pet understands. I wasn’t going to get another dog but someone said that I may not want to go through that heartbreak anymore but there are dogs (and other animals) desperately needing homes, love, respect and kindness. To provide a better life for an animal in need is worth the eventual heartbreak. So I went online and found a rescue organization. I saw that a small dog named Yuki was going to be at one of the meet and view sessions the rescue hosts occasionally at local pet stores. It was in my area so I submitted my application and went to see her. Everything worked out and she moved in within a couple of weeks. Yuki was in a puppy mill as a breeding female for 5 years. The only reason she was released was because she had a hernia and wasn’t any use to the mill anymore. She is the shyest dog I’ve ever met. She’s afraid of almost everything. Although she has settled well in our apartment, going out (even in the hallway) is stressful. For the first couple of weeks she had bad separation anxiety. Racing back and forth, barking and howling, peeing and pooping. It was a nightmare. I have a voice recorder that let me know about the barking and yet none of my neighbours complained! I have great neighbours. I should mention that when I first got her I took time off work and would go in and out to show I always returned. Luckily I work from home for most of the day and am only away at the office for a couple of hours. But I worried that she would hurt herself with all the running back and forth frantically and asked her vet for suggestions . He prescribed a mild anti-depressant. She had no side effects and within a couple of weeks showed improvement. We were able to reduce the dosage and she still seems okay. It didn’t do much for her fear of the outside though. Most of the people in my building know her story. A lot of them know about puppy mills and the ones that don’t are shocked when I explain. And I don’t hold back. The more people who know about the cruelty and abuse that goes on in a puppy mill the better the chances of closing them down. I can’t say it’s been easy. I’m ashamed to say that if I knew what I was getting into I don’t think I would have gone through with it. But I’m glad I did. She sleeps with me and wakes me up with kisses. She snuggles up to me on the couch before settling down for a nap. When I come home she can barely keep still she’s so happy to see me. We have a little cuddling session to make up for my absence. And I think that she’s starting to find some joy in her life. I hope so. Now I’ll get down off my soap box and wish everyone and their pets a Merry Christmas! 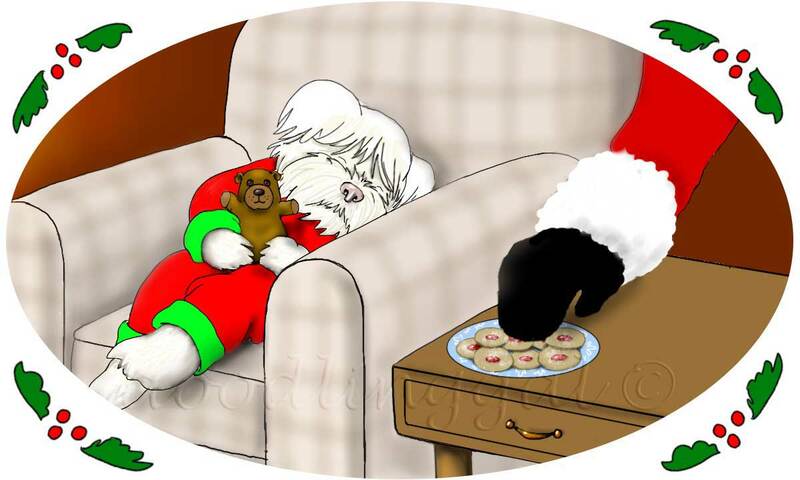 Posted in Uncategorized and tagged art, Christmas, digital art, dog, dog rescue, dogs, doodling, humor, humour, illustration, life, puppy mills. Bookmark the permalink. The superintendent in our condominium has moved on to a new job. She was a hard worker, never complained and was nice to everybody. She also had a lovely little Dachshund. We’re all sorry to see them go. So there was a farewell party for her and everyone in the building was invited to come and say goodbye. Always one for an excuse to do a card I had to think of an illustration that would befit the occasion. Knowing a trip to Italy was in her future and with her dog in mind, I knew exactly what to do. 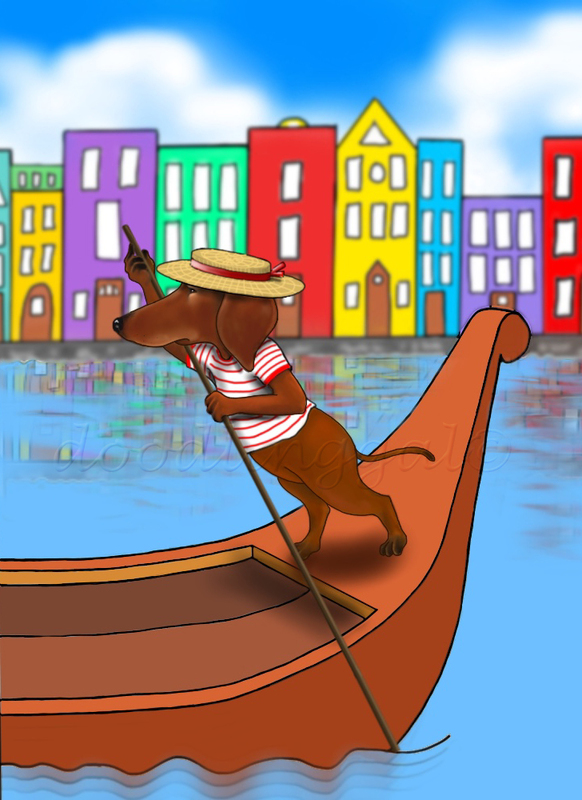 Posted in Uncategorized and tagged adventure, art, digital art, dog, dogs, doodling, dreams, gondola, humor, humour, illustration, Italy, Venetian canals. Bookmark the permalink. 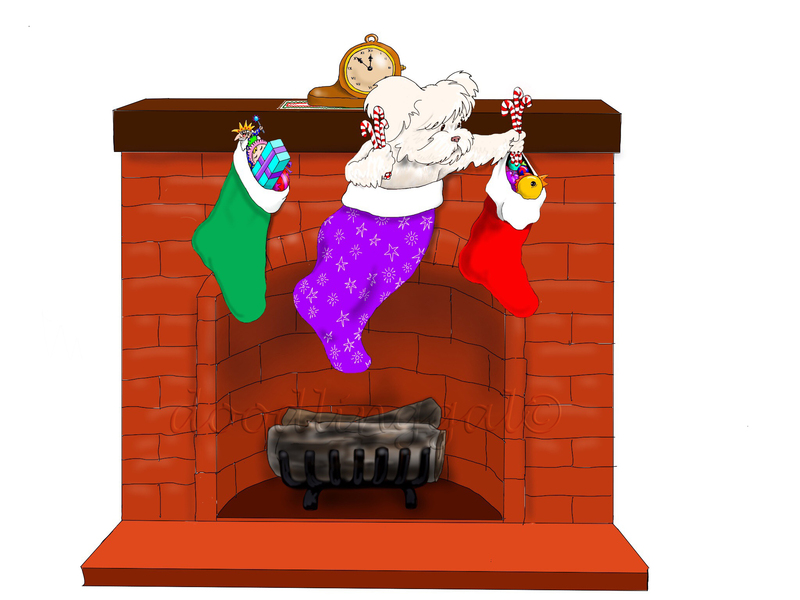 We hope everyone had a Merry Christmas and that all stockings were filled with good things! Posted in Uncategorized and tagged art, Christmas, digital art, dogs, doodling, holidays, humor, humour, illustration, stockings. Bookmark the permalink. Have a Merry Christmas everybody!!! 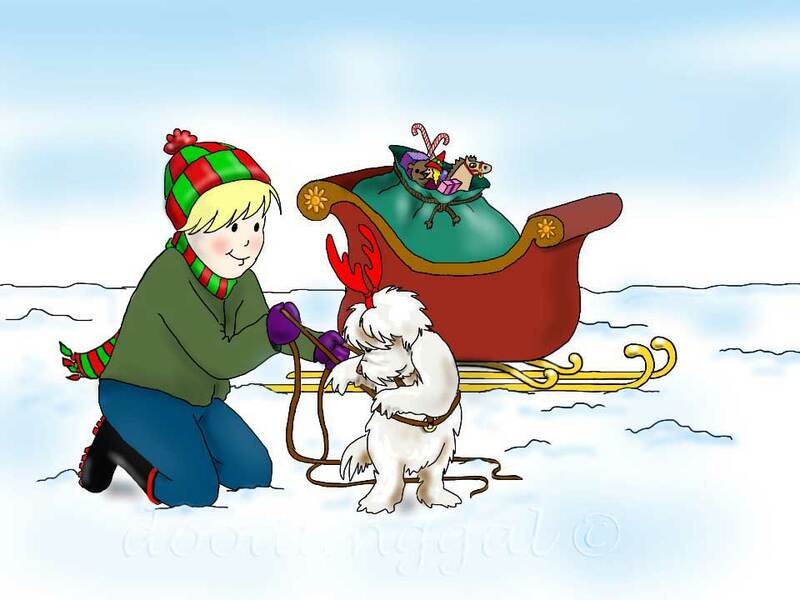 Posted in Uncategorized and tagged art, Christmas, dogs, doodling, humor, humour, illustration, snow. Bookmark the permalink. My resolutions are the same every year. To live in a warm climate and have more time to draw and paint. Well I almost made it last year! However it just wasn’t meant to be at this time in my life. Things happened that I had no control of but hopefully everything will work out in the next couple of years. The good thing is that I’ve reconnected with a good friend, have a nice home and my dog is happy. I’ll keep making the same resolutions and you never know, I might come up with some new ones! It doesn’t hurt to dream. 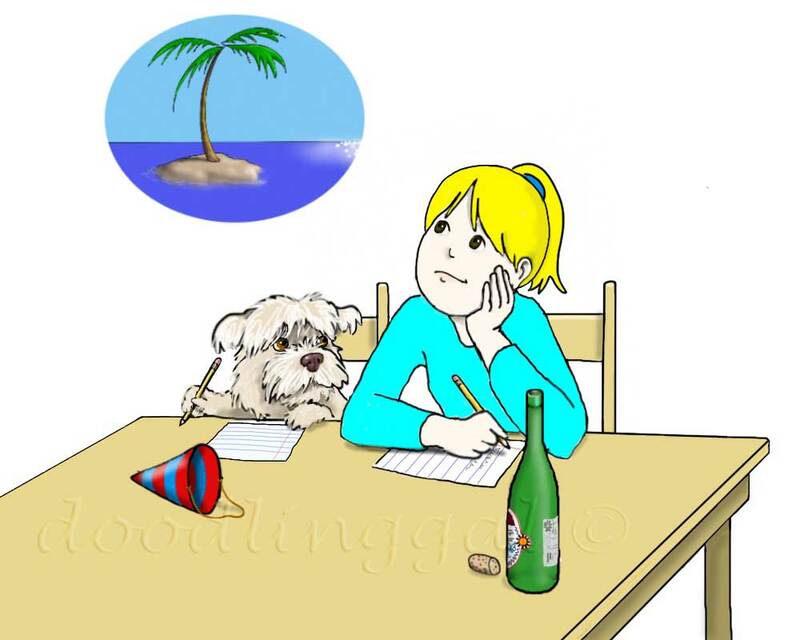 Posted in Uncategorized and tagged art, Caribbean, digital art, dogs, doodling, dreams, humor, illustration, life, New Years resolutions. Bookmark the permalink. We hope everybody has a lovely Christmas and a very happy New Year! 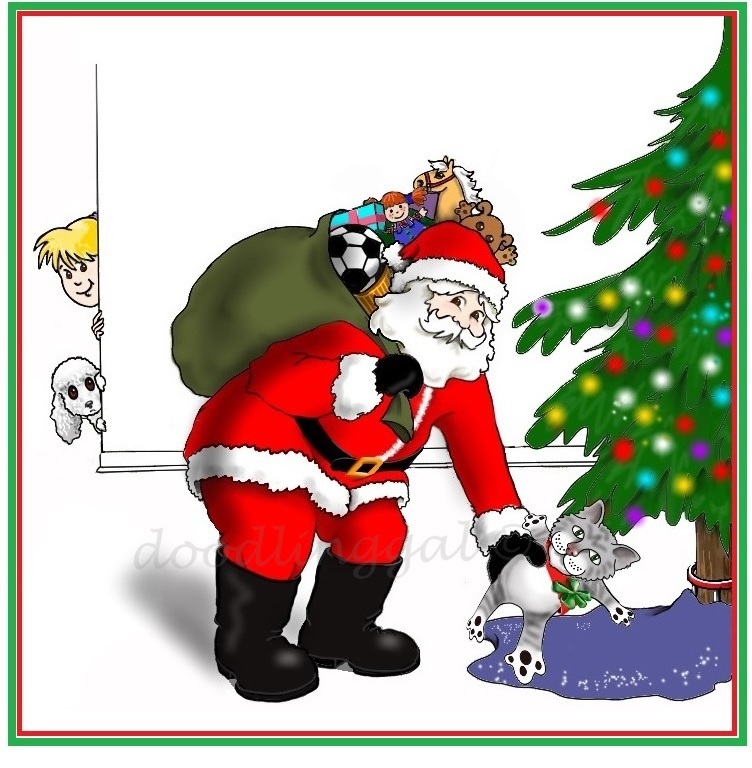 Posted in Uncategorized and tagged art, Christmas, digital art, dogs, doodling, humor, illustration, Santa Claus. Bookmark the permalink. We’re starting to get seasonal weather…as in very cold. But on Christmas that wasn’t the case. It was anything but “wintery”. We had rain and broke a record for being the warmest Christmas ever. What snow there was had pretty well disappeared. Much as I hate winter, I think Christmas is when snow and cold weather is appropriate (as long as it melts and warms up the next day). However this year Santa didn’t need reindeer, he needed rain wear. 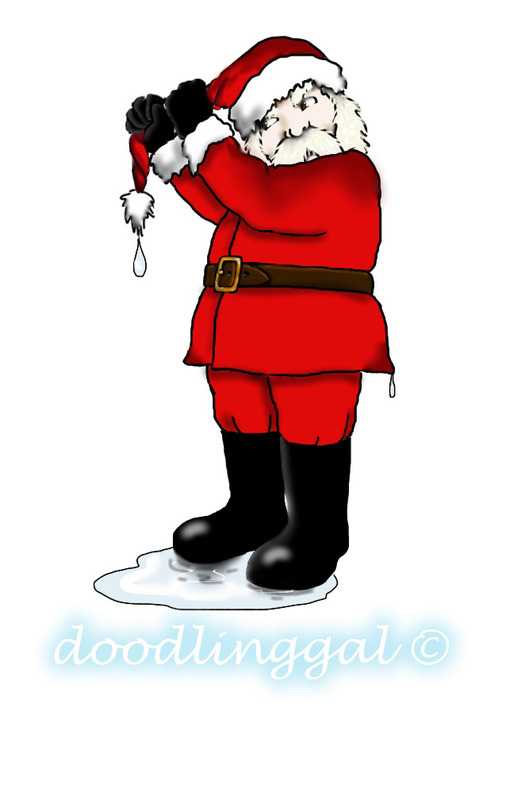 Posted in Uncategorized and tagged Christmas, humor, illustration, rain, reindeer, Santa, snow, winter. Bookmark the permalink.